Eli Manning does not feel any extra pressure when it comes to keeping his starting spot under center, but he does know the New York Giants need to win. The Giants have had extra time to prepare for their Monday Night Football matchup against the San Francisco 49ers (2-7), where two struggling teams go head-to-head. 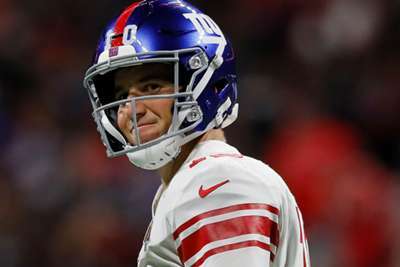 New York have picked up only one win this season and improving that record is Manning's sole focus, despite speculation surrounding his future as the starting quarterback. "There's urgency to get things going, for sure," Manning said on Thursday. "We have to get some wins. We have to get going. "We want it. The team needs it for morale, for all of the hard work that we put in, the benefits of the work, to feel good about what we're doing." Giants coach Pat Schurmur has already confirmed Manning will start but challenged the veteran quarterback to make the decision easier for him by playing better. "He's starting Monday. You guys roll with it how you want," Shurmur said. "With the idea that he is going to get us on a run here and there will be no decisions to be made. "Part of the conversation was, 'We trust you, we're going to work with you, and we trust the fact that you are going to get us in there and help us win football games.'" Manning was benched last season against the Oakland Raiders and, so far this year, he is completing 68.3 percent of his passes and averaging 268.3 yards per game. He has thrown eight touchdowns and six interceptions and been sacked a staggering 31 times.